What is wrong with motherboard names these days!? Sometimes I feel like a frumpy old man reading these reviews :). Nomenclature asside, Skylake has me a bit excited, and with the recent outpouring of product, and reviews around the ecosystem it looks to have taken the OEMs and PC sites along as well. After Intel left the motherboard market, I’ve more often than not ended up with ASUS powering my builds. So I was intrigued to see what their high-end ITX board had on offer. Overall looks solid, but the lack of DisplayPort and M.2 (OK, U.2 is there) kills it for me. 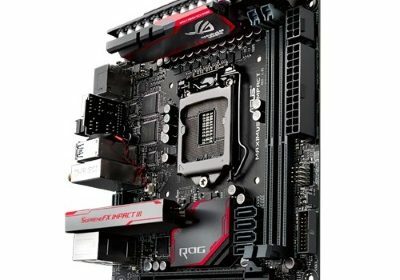 ASUS utilizes some interesting techniques to bring full-sized ATX features to the mini-ITX arena. For starters, the motherboard has four daughterboards, and they serve her well. Going from largest to smallest; the first daughterboard carries a hefty VRM that powers the CPU and DRAM, the second provides SupremeFX Impact III audio, the third provides Wireless AC with MU-MIMO support, and the final one provides Impact Control III (POST code and OC features). This little motherboard is jam packed with features you usually find on larger full-sized ATX motherboard. Let’s take a look at this deceivingly tiny beast.